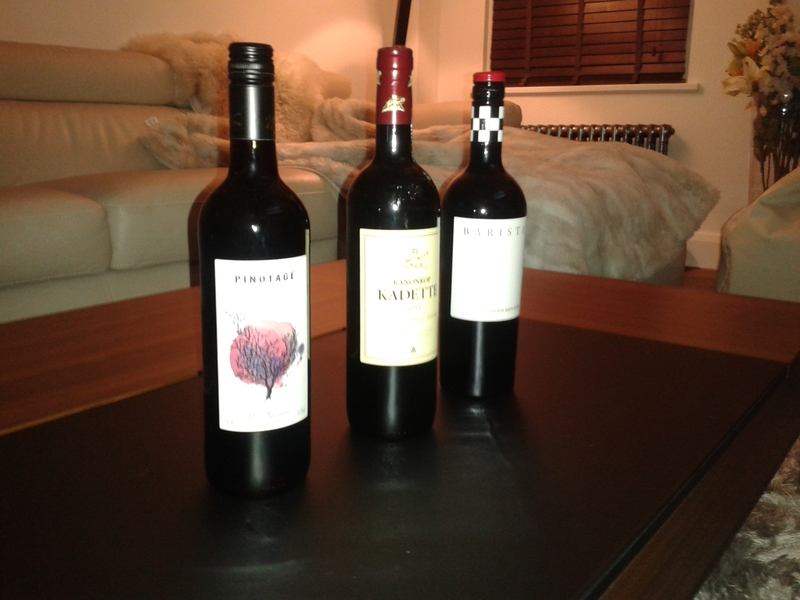 We’ve had a couple of meals this weekend with Pinotage. We had the two heavier efforts on the Friday night and the lighter one on the Saturday for lunch. Was pretty evident from just these three that Pinotage has a few flavours that are consistent, and a few that have everything to do with the producer’s will. That’s got to be quite good for us lot, I don’t think you could ever call it boring to drink. As soon as I heard that the heavier styles of Pinotage should go well with game meats (Pinot Noir is one of the parents in the crossing, and that’s usually great with game), I thought about venison. I absolutely love the flavour of venison, and as has been pointed out by a few people, the perfect pairing would have been a venison steak with a dark chocolate jus. Unfortunately (or fortunately for my bathroom scales) the missus doesn’t like chocolate at all, so we never have it. So I decided to stick with the completely under-rated sausage sarnie. Venison sausages from the butchers’, toasted bread, butter, Dijon mustard, and a blob of lingonberry preserve just to give a bit of a lift to the heavy flavour. Without food (and with the sausage on its own), for me anyway, the Barista won hands down. I loved the deep chocolate and coffee flavour, which overlaid spicy plums and dark cherry. The medium body was surprisingly smooth given such a young wine (2013), and the balanced finish lasted for a good 30 seconds or so. Really liked it. 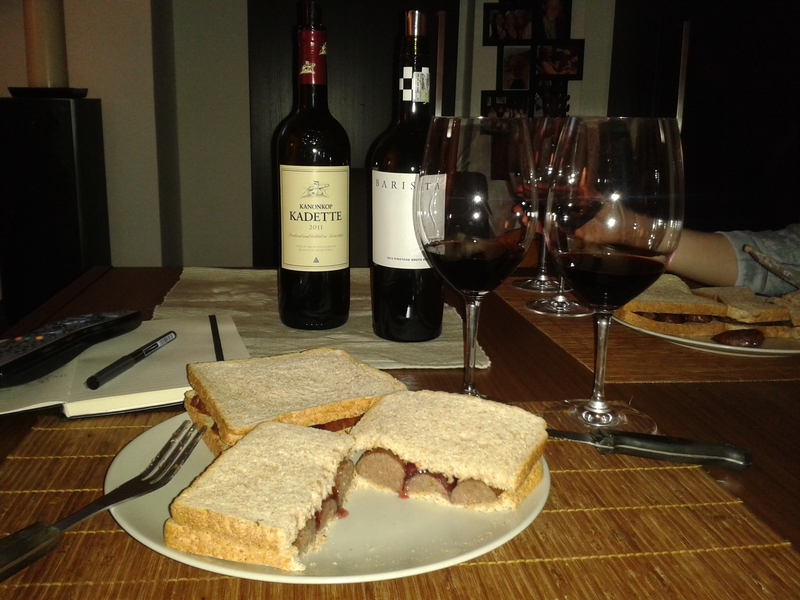 With the sarnie though, the Kanonkop came into its own. The smells were a lot sweeter in this one. How do I put it? It smelt a bit like pic n’ mix. You know the chocolate bananas you can get? That, it smelt of that! Again a medium body, but the tannins weren’t quite as smooth in this one, but the spiciness of the Pinotage was pretty evident. The finish was again slightly longer than I expected for wines of this price, a good 30 seconds or so once more. Once we had it with the sandwich, and the hint of sweetness from the lingonberries, it was pretty great. The completely under rated sausage sarnie! We decided to have the last one with lunch on Saturday. I might have meffed this up a bit given it was the most alcoholic of the 3, at 14.5%. I felt it a touch as we headed into town in the afternoon, but we were off to see Spamalot, so not the worst show to be a bit half cut for! First and foremost I need to talk about my new favourite cut of lamb: chump! It’s so meaty, beautiful marbled with fat, and the skin covering it is reminiscent of the crackling you get with belly pork. Lamb rackling? Amazing! I cooked it slow having seared it in a pan, the sliced it thinly and popped it in a flat bread with lettuce and tomato. I was a bit worried about using mayo, whether it would be a bit wrong, so I mixed the tomatoes with the mayo, salt and pepper, parsley, and a touch of chilli powder. I put the tomatoes at the bottom of the flatbread, and then drizzled the juice over the lamb on top. Went pretty well I think. The Signature Pinotage divided opinion in our household. The wife thought it was here favourite, mostly because the chocolate flavours were a lot more subtle, the flavours were more raspberry and red cherry, and it wasn’t as full bodied as the others. For me though the tannins were a bit too grippy, and I just don’t think the alcohol was balanced enough. 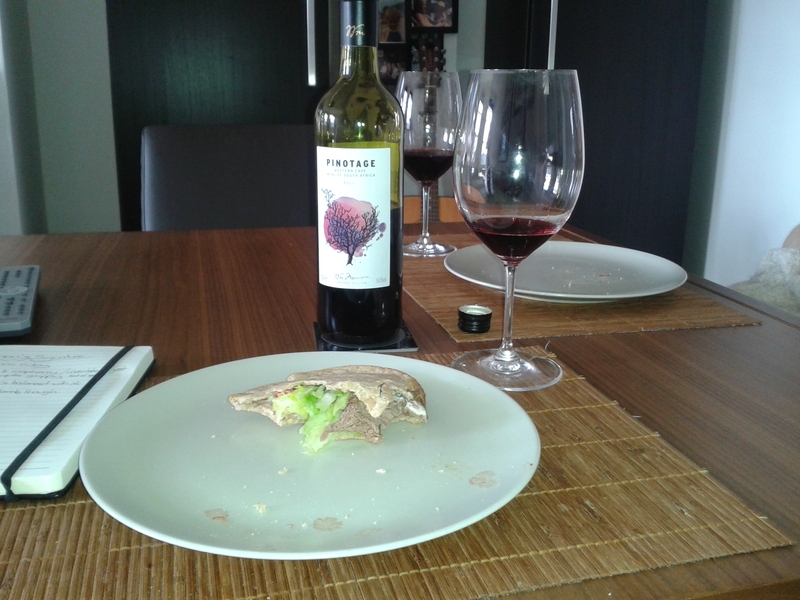 We were both pretty happy with the food pairing though, and the hint of chilli powder in the mayo mix went well with the spiciness of the wine. Slight problem, I was so hungry I forgot to take a picture til the last minute, trust me it was great! All in all it was a really nice week. I’ve loved Pinotage, mostly because I’m a closet chocoholic and I like heavier spicy reds. It also gives you a great opportunity to eat some of the fuller tasting meats out there, which you can do so much with. Overall I’m giving it a very respectable 7/10. Ant, over to you for next week! It’s been an excellent week… I’ve had 3 and enjoyed the lot!